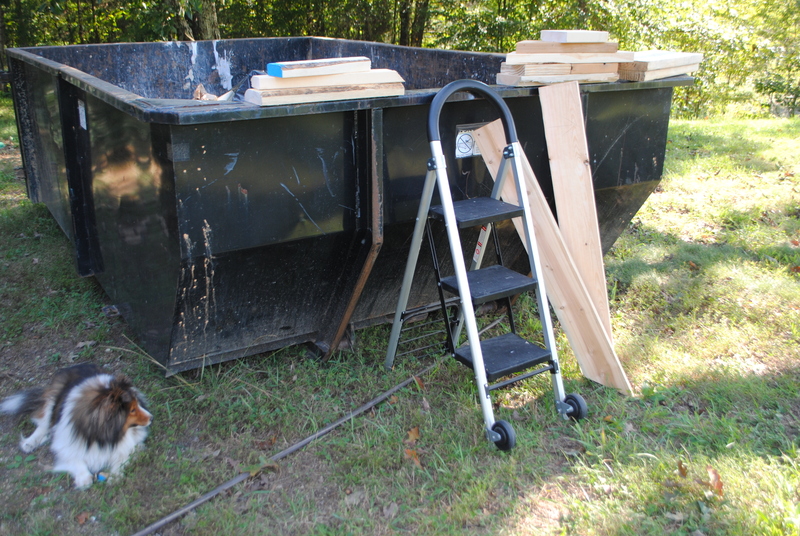 Early in the construction process, a dumpster was delivered. We had to find a level spot, so next to the back porch was the best we could do. 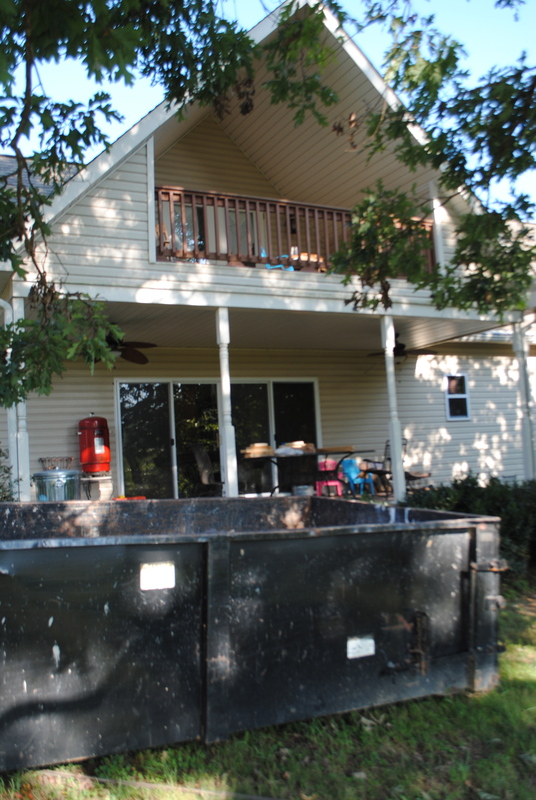 Since the guys go in and out the front door or out the attic window and down the roof, it was a bit of a hike to toss things in the dumpster. 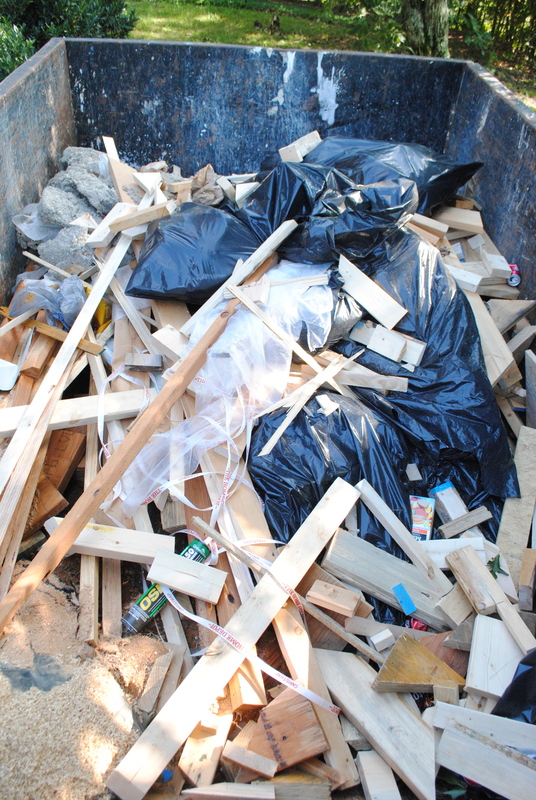 But Todd (who’s usually on dumpster duty) discovered that for smaller chunks of debris, he has a straight shot from the craft room balcony down into the dumpster. 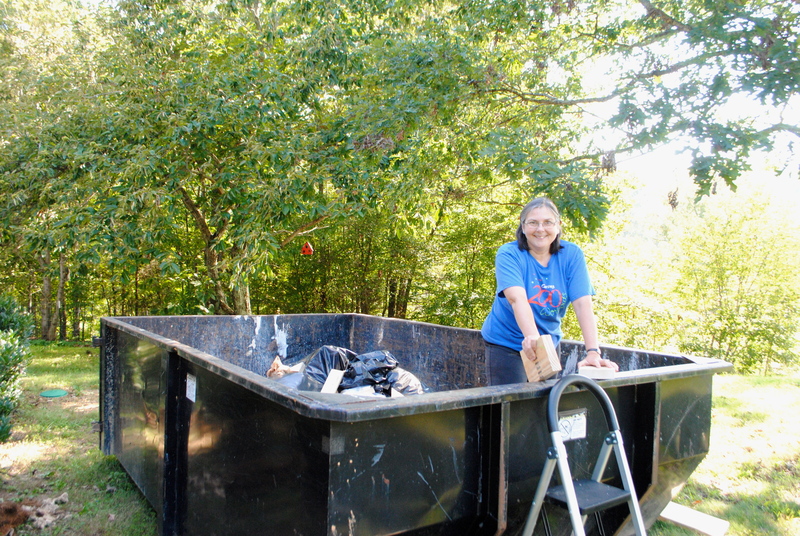 So when I decided to go dumpster diving on Thursday, the first thing I did was to warn Todd not to chuck anything off the balcony until further notice. I figured he wouldn’t be expecting to find the homeowner in the dumpster and might chuck before he looked! Why did I decide to go dumpster diving? Much of Thursday morning was taken up with a trip Kara and I made to Interior Trim & Supply. I worked with someone there 10 years ago when remodeling our (previous) Victorian house, and I knew they were an excellent source for all kinds of doors, casings and trim. I explained the Wardrobe to Randy, the helpful salesman, and he went right to work helping us find products that would help us create a wardrobe out of thin air. One thing he didn’t have in a big enough size was a shaped piece of wood large enough to hold the Wardrobe lion. He had “keystones” that would do the job, just none large enough for our lion. But I figured that any carpenter worth his salt could make one if he had a bock of wood–and I knew just where to find one. I’d been watching Todd throw blocks of wood into the dumpster for the past two weeks! Herb and I have been dumpster diving in the Tractor Supply dumpster (with permission) looking for pallets to store hay on. 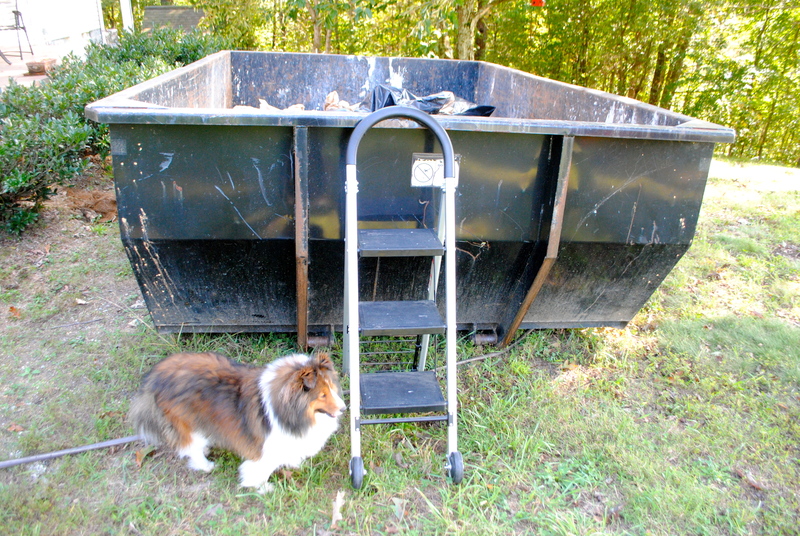 Their dumpster is HUGE, so Herb has done most of the diving while I stood on the ground to receive the goods. This was my first time to do the actual diving, and I must admit, it was lots of fun. I think there just might be a shopping cart and a plastic bag in my future!